Beef rump roast is a great choice for dinner. If you are having guests this will send them home satisfied. 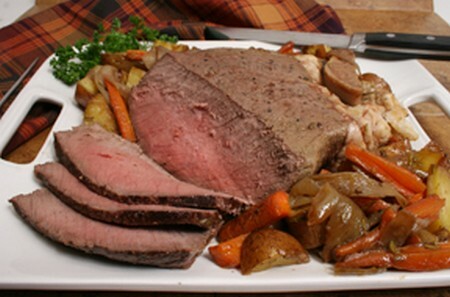 The rump roast is cut from the bottom round section. This slice of beef is not terrible expensive in the grocery stores. They are commonly found in grocery stores everywhere. Having rump roast has its nutritional value. One serving is 3 ounces. It is 178 calories and is loaded with essential proteins. It has 28 grams of protein. That’s 54% of the entire daily recommended intake in one sitting. Rump roast isn’t difficult to prepare and may be served with other things or it can stand alone. Preheat you oven to 325 degrees. Remove the roast from the packaging it came in. Look at your cut of meat. It should look bright red if it is fresh. Maybe not of previously frozen. If your rump roast has freezer burn, throw it away. Also, if the meat has a putrid smell do not buy, eat or prepare. Put the roast in a roasting pan. Position the roast fatty side of the rump roast pointing up. Season the meat with meat tenderizer, pepper, salt or other seasonings you may be fond of. Put the meat in the oven on the middle rack. Cook the rump roast without a top or aluminum. The USDA says a roast needs to be cooked 35 minutes for every pound. Use a timer to make sure you do not overcook the meat. Overcooked roast can be very tough to eat even if the flavor is good. Be careful not to overdo it. Cut the vegetables up and place them in with your rump roast. You do not have to add these. If you choose to, opt for things like potatoes, carrots and onions. Wash all vegetables prior to using them for this dish. This reduces the chances of food poisoning. Add about 1 ½ cups of broth to the pan with the beef rump roast and mixed vegetables. Put the roast back into the oven and continue to cook for about a half an hour more. The vegetables should be very soft and fork tender. Check the internal temperature of the beef to make sure that it is cooked through. The temperature should read 145 degrees. Keep it over the heat to make sure it reaches this height. If you know you are going to have some rump roast left, cover it and refrigerate.The roast will last up to four days if cooled. It can also last 3 months if stored in the freezer.